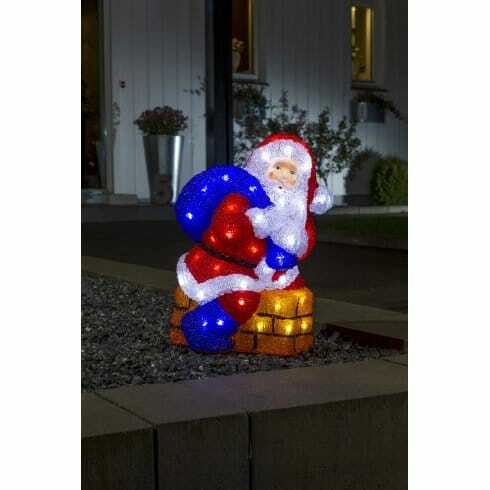 Konstsmide Santa acrylic figure is a cheerful addition to your festive winter garden scene. The product code for this Konstsmide acrylic Santa figure is 6172-203. The figure is moulded as Santa stepping out of a brick chimney with a sack over his shoulder and incorporates 48 bright white LED's throughout the design. A truly festive Christmas decoration which will provide sparkling illumination to your outdoor wonderland and lots of Ho Ho Ho! Suitable for indoor or outdoor use and transformer included,this product must be plugged into an indoor socket. A range of illuminated Santa figures are available to order on our website, they are an ideal choice for brightening any garden this winter.